No matter which subset of the GIANT SAP technology landscape you want to land it be – CRM , Billing, ERP or any other animal. It’s expected that you would talk fluently and have the basic understanding of the Hana & S4 along with the industry domain. The following article, courtesy , eursap.eu summarizes this for us readily which can be also found in SAP training materials. The 31st October 2016 was the date that SAP’s S/4HANA 1610 was released for general availability. This release followed the previous SAP S/4HANA 1511 release, which was the first end to end offering by SAP in the digital enterprise space. Expectations had been building up after a year of development of what was the first version of SAP’s next-generation ERP. Below we start to explore the new SAP S/4HANA 1610 release. 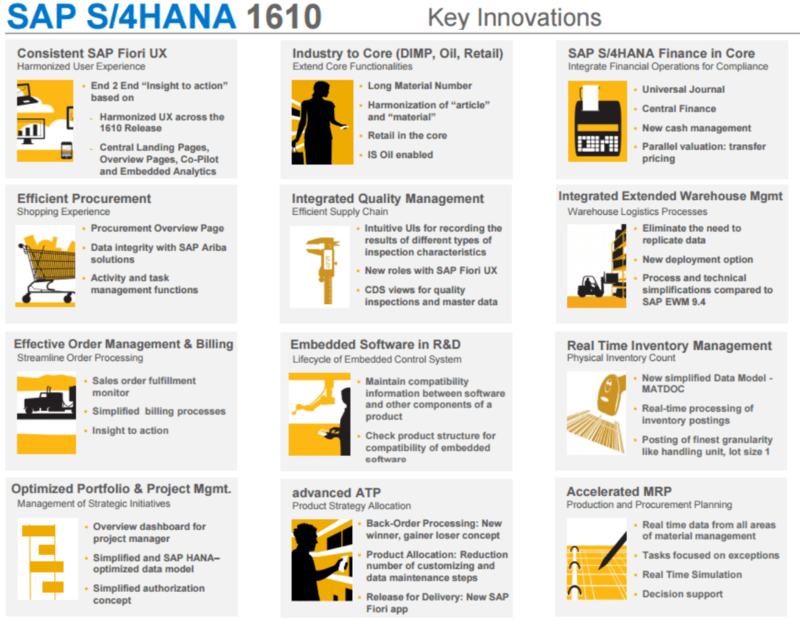 We will explore these innovations and the path to 1610 in this blog. S/4HANA 1610 is the latest offering in ERP by SAP with simplification and innovation across the entire solution landscape of SAP. 1) New Implementation or greenfield implementation- This replaces any legacy or old SAP system by performing a fresh implementation on S/4HANA. 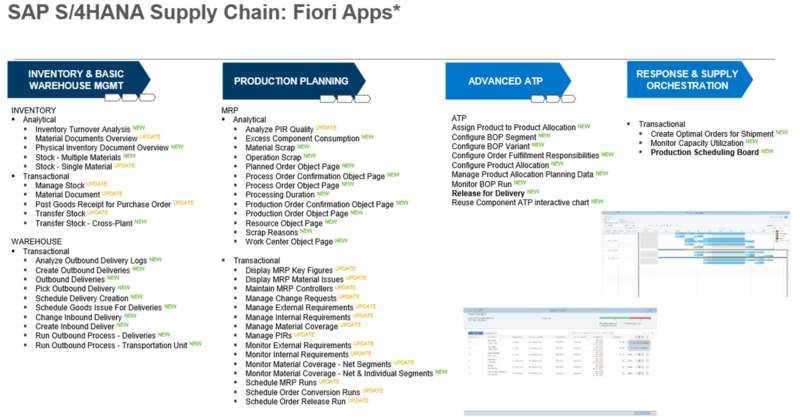 2) Migration to a new instance of S/4HANA from their existing SAP ERP. This is to upgrade the current SAP ERP system to S/4HANA by performing database and functional upgrade. 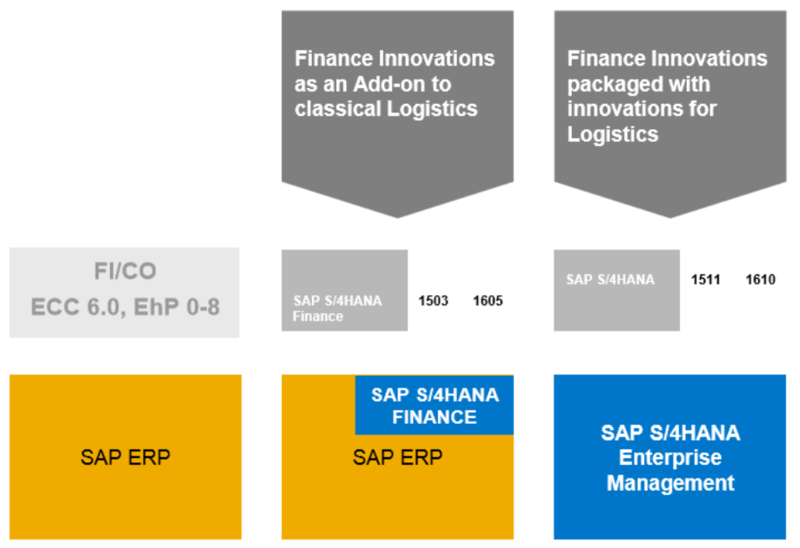 3) Consolidation or transformation to S/4HANA by using SLT and Central Finance solution. 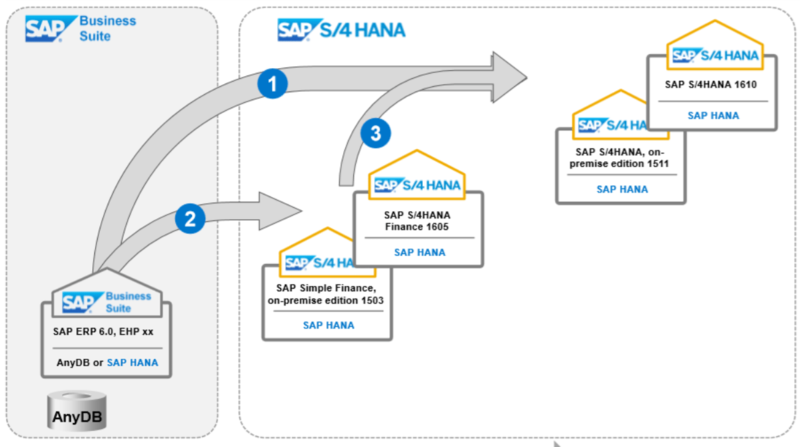 For clients who are currently looking to start their journey to S/4HANA, the 1610 release is the key version to evaluate. 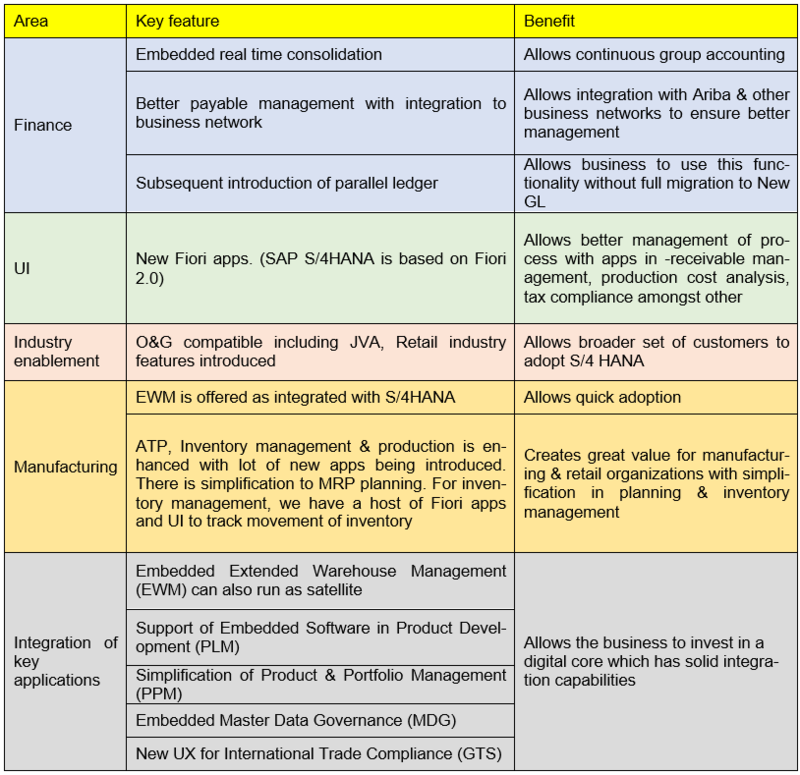 1) The SAP S/4HANA 1610 release offers a lot of new features and capabilities. It also extends support to industries like Oil & Gas and Retail. 2) The 1610 release is the major release by SAP until the SAP S/4HANA 1709 release which will be towards the end of this year. 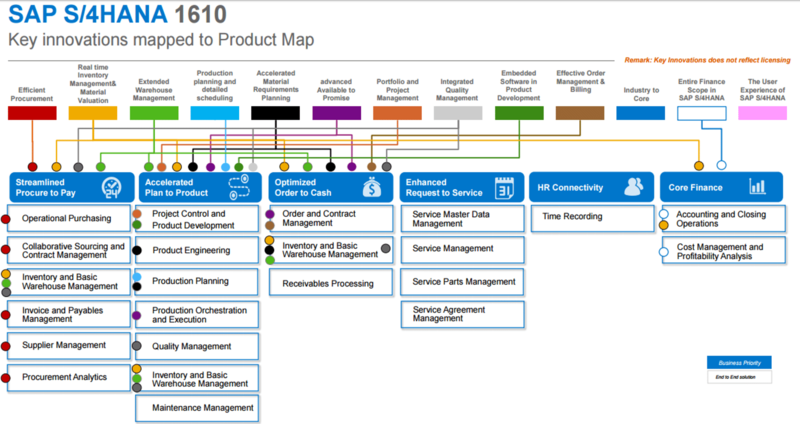 For upgrades to S/4HANA , SAP offers a maintenance planner. There are also enhancements for the custom code migration worklist. The change allows you to check the customer code and allows the customer to check their code before they begin the migration. The code migration worklist is linked to the ABAP code check tool. SAP S/4HANA 1610 is the most advanced solution on offer by SAP with a lot of key innovations. We will have a look at the key changes and their implications for business. For those interested in the complete list of SAP S/4HANA 1610 simplifications, please check the link: Simplification List SAP S/4HANA 1610.